In August last year, I published a Blurb photo book of my “wall” project. (You can view the background to the project here and a preview gallery here.) When I got my first copy back from Blurb, I was pleased with the result and the people who saw the book, liked it. 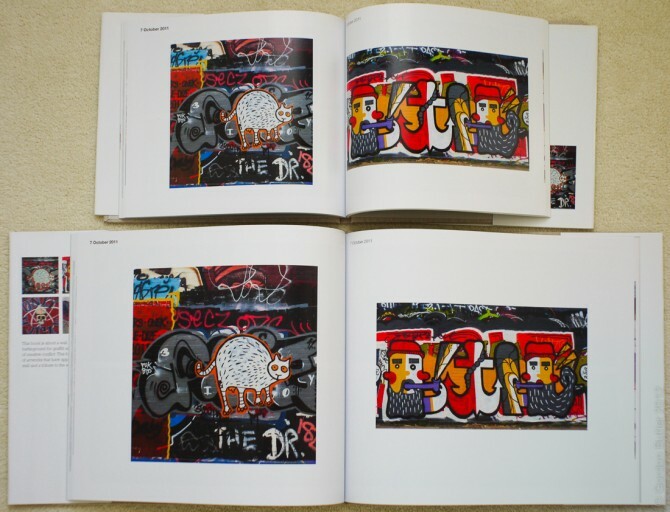 However, I felt there was something that didn’t quite connect between my first-hand experiences viewing the works on the wall and the images contained in the book. The quality of the photographs was fine and I felt the narrative was communicated effectively by the design and selection of images, but there was something missing. After a bit of thought and some experimentation, I decided the first version of the book was the wrong size. The wall book used Blurb’s standard format landscape book – 25cm wide by 20cm (10’x8″) high and this was too small for the project. The images appeared too close to one another, the layout was too tight. The photos were printed as large as they could appear on the page, mainly in order to show as much detail as possible, but I’d crammed ] 164 images into a book with 100 pages. There was little white space. With this in mind, I redesigned the book and decided to use the largest Blurb landscape format – 33cm wide by 28cm high (13″x11″). I uploaded and placed an order for this much more expensive (almost double the price) book and it arrived a few days ago. This new, 85% larger, edition works much better. Naturally, the larger photos show considerably more detail, but the interesting effect is the change of pace one experiences reading this version (do you read a photo book?). You feel encouraged to spend more time on each page and, even though the book has exactly the same number of pages, the same photos and the same words, there’s a stronger feeling for the scale of the works featured in the photos and the timeframe in which they appeared. Interestingly, a few images are only slightly larger in the new book than they were in the old, but the extra whitespace around them makes them look less confined and gives them a chance to “breathe”. In these slightly enlarged images, you feel there’s a lot more detail, even though, when comparing the same image side-by-side, you can see the level of detail is pretty close. A five percent enlargement doesn’t enable a huge increase in detail. The perception that there is more detail is, perhaps, a result of the increased whitespace. Neighbouring images, don’t occupy your field of view. Whatever the cause is, it works. I don’t believe a still larger edition will provide an even better experience, I think the 33cm x 28cm format is ideal for this particular project. (In any case, a larger one would be enormously expensive – the current larger edition costs around £70, delivered and I’m not making a penny of profit on that.) Although a very large book would be pretty impressive on one’s coffee table. In this instance, I feel a much larger format would not deliver a further improvement. Output image size has been something of a preoccupation of mine for a quite a while. It’s an issue I still haven’t resolved yet for my pathways project and was a major consideration in the re-design of my web site. Why do photographers’ sites often have such small images? Most of us are not using dial-up. The lesson I’ve learned from my wall photo book project is size really does matter. Before you show any of your work, you need to test your ideas thoroughly, before committing to a particular size and format. You need to test prints at a range of sizes and consider your potential viewers’ circumstances before you commit. The initial investment pays in the final outcome and, as is often the case, it’s the first impression that counts. You are seldom able to return to your artistic clients with an “improved” product, so test and re-test until you’re sure of the result. In my opinion, it’s best to start small and increase image size until the photos work for your ideas. It saves splashing out on something expensive that might not work. With my wall photo book, I still have a handy portable book in the first version. These two different versions of my book were also a great test of the consistency of Blurb’s printers. The quality of both books is excellent There’s no discernible difference in reproduction values between the two differently formatted books (albeit the same image files), which were printed several months apart.